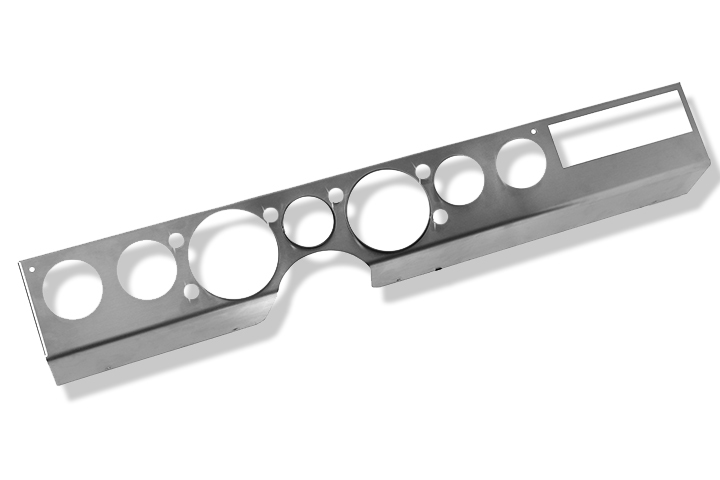 Gauge cut-outs are 3 3/8", and 2 1/16", We also can provide you this panel fully trimmed with all gauges, wiring (SP17954), and senders required for a complete installation. See SP13689 for that. This is a new stainless steel instrument trim panel to fit all Scout II, Terra, and Traveler vehicles. If you would like to update your old gauges with some modern dependable units, this is just the ticket. This comes with a #4 brushed finish, and can be ordered with a hole for the stereo (to fit most modern stereos or CD players), or with the radio-delete option (no hole at all).